We present a chocolate centerpiece with a difference… This board comes with a selection of milk and dark craft chocolate bars from some of the most popular makers in our library so you’re well prepared to host your own chocolate tasting. Inside this collection, you’ll discover single origin bars from Marana, Chocolate Madagascar and Original Beans. Charles Dickens once said “There is nothing better than a friend, unless it is a friend with chocolate.” This gift is ideal for chocolate lovers and enthusiastic entertainers alike. A stylish addition to any dinner table, this board comes with a raised “breaking bar” on which you can easily snap off a square of your chosen bar. When we first conceived of the craft chocolate sharing board, it was as an alternative to a cheeseboard, and as a way to share single origin chocolate with family and friends after a meal. One challenge was immediately clear. 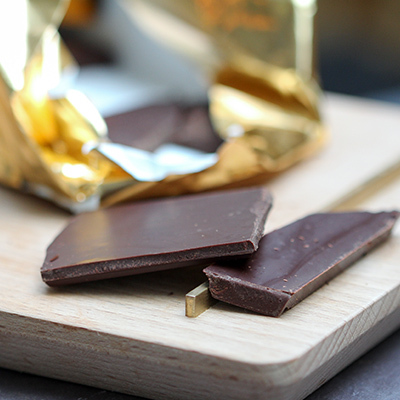 Whereas cheese boards are often accompanied by a knife, you can’t easily “cut” chocolate. Rather you “break” or “snap” chocolate – but this can be quite tricky and, often, a bit messy. So we worked with Benedict Wilhelm, an industrial designer, to find a solution. 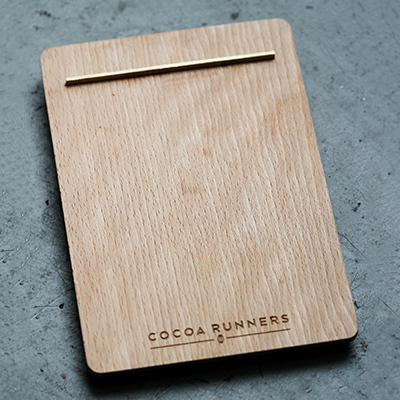 To quote him “we sought to find a simple and elegant way for people to share their chocolate bars. The solution was to insert a brass rail into the board, which acts as a breaking edge for the chocolate, celebrating the chocolate bar with the clean snap it deserves”. This board comes with a selection of milk and dark craft chocolate bars from some of the most popular makers in our library so you’re well prepared to host your own chocolate tasting. 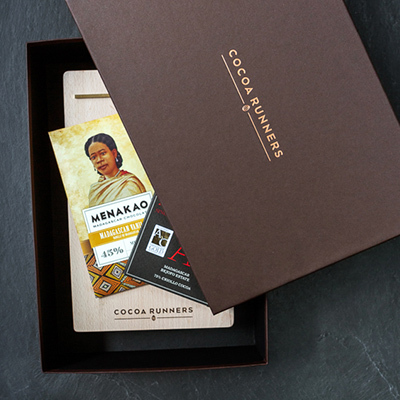 Inside this collection, you’ll discover single origin bars from Menakao and Akesson’s. The 50% milk chocolate from Chocolat Madgascar doesn’t just taste good, it does good. 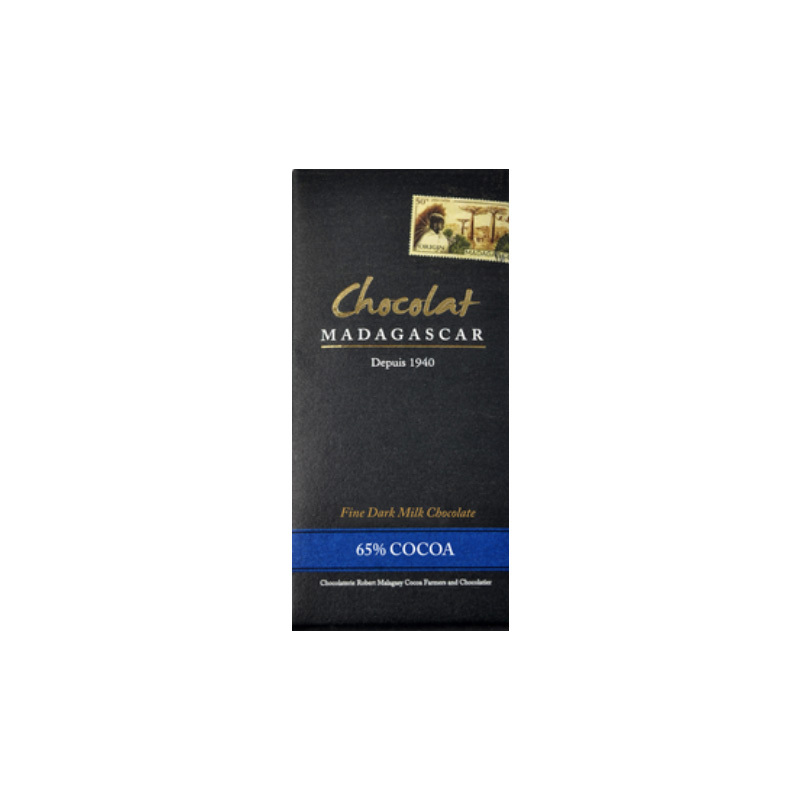 Madagascan chocolate maker Chocolat Madagascar proudly crafts its chocolate on the island, using only local ingredients. Unfortunately, this is rare even for craft chocolate – it’s estimated that less than 5% of the world’s chocolate is produced in the same country the cocoa is grown. By making the chocolate in Madagascar in addition to growing the cacao on the island, Chocolat Madagascar generate about 4-5 times the benefit of Fair Trade for the local Madagascan economy. 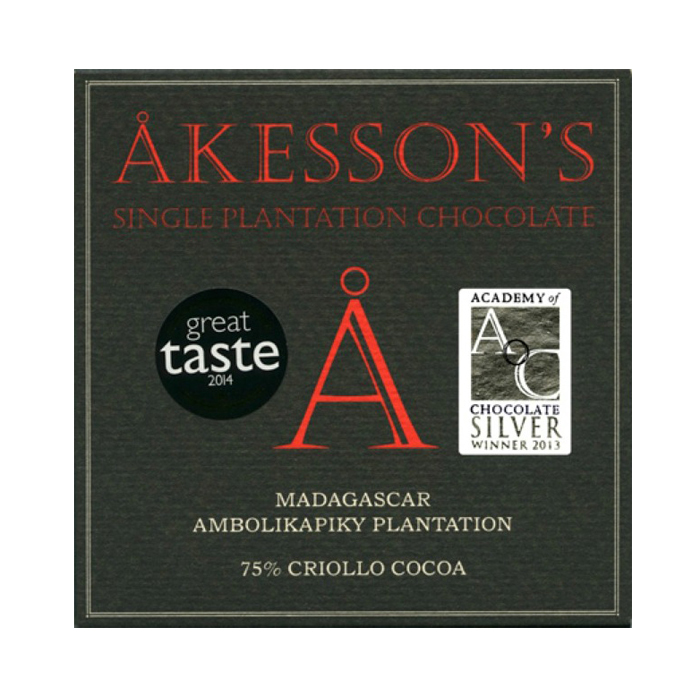 The 75% dark chocolate bar from Akessson’s is a great example of the influence of terroir on taste, and a rare one at that. To put it into context, this estate produces 300 tons of Trinitario cocoa every year, but only 2 tons of Criollo beans are available to be harvested separately to make this bar, a very limited supply. In 2018, these Åkesson’s Criollo beans were awarded Heirloom Cacao Preservation (HCP) status. This has the typical rich and fruity taste of a great Madagascan bar. We detect berry notes and a lemony aftertaste with a subtle tartness. This is a satisfying, strong roasted cocoa with just the right amount of sweetness.